Last week I was in Liverpool, where the Biennial of Contemporary Art was just getting started. It took me by surprise – I was just there to look after someone else’s cats and write – but one look at the brochure made me take notice: so much video. 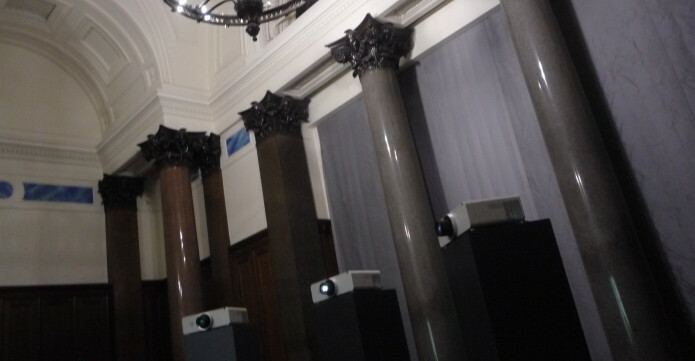 Of course, the video projector is by now as fully integrated into the art world as the sculptural plinth, and the black box is very much an expected part of the white cube. 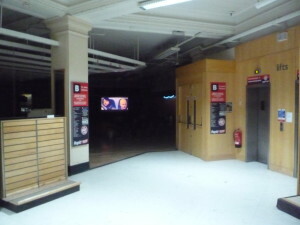 Conversely, as Maeve Connolly argues in The Place of Artists’ Cinema (2009), the gallery has become another ‘alternative’ screening venue within film culture, holding a space for the ‘gallery film’, the experimental and anti-mainstream. This alterity is not only concerned with the formal dynamics of the works, but with the relationship they propose with the viewer, with heightened awareness of the reception space and a break from theatrical cinema etiquette and expectations. I didn’t get to see Varda’s installation. I did catch a bit of a screening put on by Empty Spaces Cinema in the cavernous basement of the George Henry Lee building as part of the Independents Biennial. 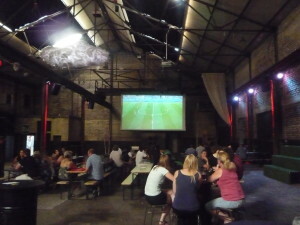 I also saw a bit of football on a big screen at the Baltic Triangle, where every other warehouse seems now to be a gig venue with pop-up screenings. Like with the gallery film, the differences between big-screen football and cinema are those of social convention; it is the same apparatus. There is plenty of untapped richness in that ambiguity; in Glasgow, earlier this year, the Goethe Institut put on a live-score screening of a Germany match. And then you’ve got Zidane, the feature-lenght film made by Douglas Gordon and Philippe Parreno following the player through a whole game. As Connolly points out, Zidane premiered at Cannes, was then screened in a stadium at the Basel art fair, and circulates in galleries as an art object, a ‘double-channel limited edition’ (26). Video works like this then have a multiple existence and blur the boundary between film festival and art biennial. However, the history of artists’ moving image is also closely linked to site-specificity and installation. It is still in this centrifugal relation to the world that the strongest works emerge. 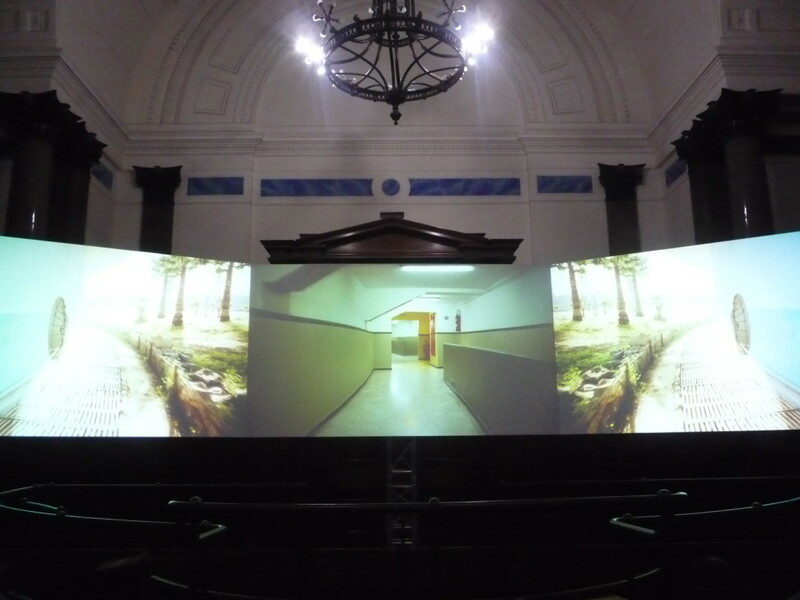 I was very moved by Two Meetings and a Funeral (2017), a three-channel film by Naeem Mohaiemen installed in the courtroom at St George’s Hall. The work is an 85-min documentary about the Non-Aligned Movement, a transnational political project that perhaps people in the global North haven’t really heard much about, but which is at least a familiar phrase to those of us who grew up in the Third World when it was still called that. The camera enters the Palais des Nations in Algiers, where the 4th summit of Non-Aligned countries took place in September 1973. Archive footage and interviews reconstruct the historical density of the occasion, with Fidel Castro holding court and Kwame Nkurumah denouncing the ongoing attack on Allende’s socialist government in Chile, which would culminate in the bombing of the presidential palace and the start of Pinochet’s dictatorship two days after the end of the Algiers summit. The film lets us take in both the high-minded critiques of imperialism that made nationalism seem like a viable plan for decolonisation, and the macho intrigues that morphed into dictatorships instead of the liberation promised. There is a theme of unrealised utopia, almost a fatalistic sense of impossibility undermining the exhortations for unity and self-determination. The three-channel composition allows for some formal strategies not usually available to single-screen films, counterpoints and explanations running alongside rather than cutting into each other: it is a good documentary. But its installation in Liverpool lifted it beyond its informative, reflexive approach to history. The three screens are neatly set up in the middle of a court room, which is reached after walking through the dungeons now set up as a history display memorialising the thousands of poor who suffered here. In the film, there are long sequence shots that circle around La Coupole, a sports stadium designed by Oscar Niemeyer in Chéraga, Algeria. In the archive footage, gymnasts on the asymmetrical bars twist and spin; now, this is a modern white elephant which costs too much to maintain. Then there are the open-air corridors and flat plazas with water features to freshen up tropical afternoons. I felt at home in those spaces. I recognised the utopian architecture of the university where my parents met and also of the university that formed me. Yet here I was, watching it in the oppressive space of a windowless court room, all dark polished wood and injustice, thousands of miles away. The spacious and abstract (and yes, also inhuman) architectures of Algiers belong to a different order than this Neoclassical behemoth, with its penitentiary system hidden behind a concert hall, its Roman columns and equestrian statues. St George’s Hall is an imperial statement piece. La Coupole is meant to be an anti-colonial one, but the film wonders whether that struggle needed the grandiloquence of monuments. It has been a year of trying to settle accounts with 1968 and its legacies. On Friday, Big Adventure Cinema, who are on course to build a new community cinema for Liverpool after the closure of the Little Cinema, hosted a screening of Made in Dagenham, preceded by the 1971 Ken Loach short Talk About Work, and discussed by four women who worked in the local Ford plant (Halewood) and took industrial action for equal pay during the disputes depicted in the film. The screening took place in the Casa, a pub and venue whose story goes back to the Dockers’ strike in the late 1990s. In the audience were current workers at the Halewood plant (which is now Jaguar Land Rover) and trade unionists with similar experiences in other sectors. This framed the screening of this fairly mainstream independent film in a context that was both celebratory and educational. A recurring theme was the vacillation between recognising the achievements of the workers in the 1960s who fought for equal pay legislation, and raising awareness that in practice the gender pay gap continues to exist. There is a melancholy to radical history, particularly now when the forces of Fascism have more power than they had had since the 1930s. Was it all in vain? Well, the game isn’t over. (Even if the World Cup is). In between our anger and our grieving, we must find space for some learning, some thinking about the past and the future. These two screenings, both political, both site-specific, deploy very different strategies for their critical historiography: architectural dialectics and local personal experience. When I spoke to my dad (pictured above, with my uncles, trying to look cool) about my current interest in non-theatrical exhibition, he told me again about ‘Cine Mejoral’. This was a free film show, projected on a wall, which he remembers attending when he was growing up in a small town, Chinchiná, in Colombia’s coffee region. He remembers sitting on benches in a patio with his brothers and friends, watching Westerns and Mexican films. It was the early 1960s and the town had a fine permanent cinema, where they would often spend “social triple” on a Sunday afternoon, but Cine Mejoral was free, as it was sponsored by Mejoral, a brand of painkillers. My mother, from a smaller town not far away (Pácora), also remembers these free film shows in the village square, projecting on the walls of a wealthy family’s house. I remembered this story when Richard McDonald mentioned that some of the cinema vans used by itinerant projectionists in Thailand were bought from pharmaceutical companies. Of course, health campaigners and educators had been using mobile film units for quite a long time. In Colombia, the Ministry of Education had cinema vans at the end of the 1940s. But as soon as we started Googling, it became evident that Cine Mejoral was part of something pretty big. 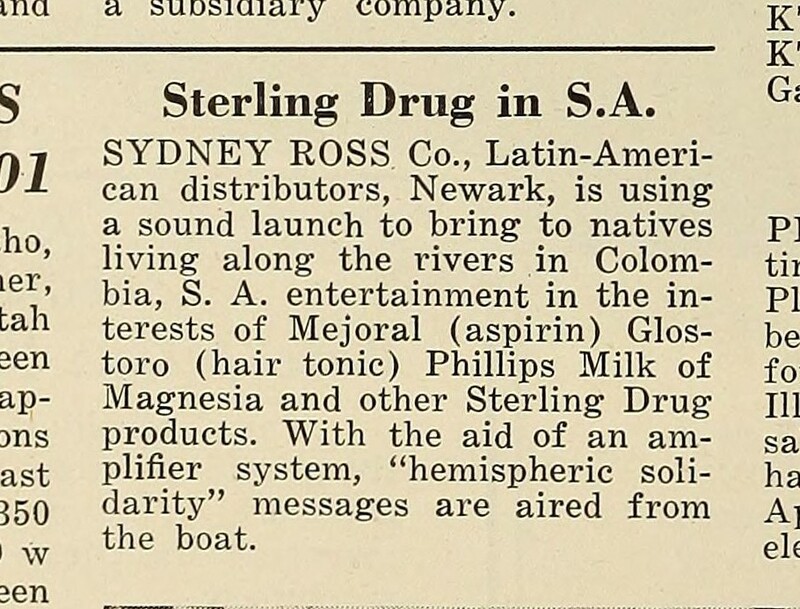 Mejoral’s promotional cinema operations spread across Latin America, sticking to the same pattern. A simple search brings up examples in Nicaragua, Guatemala, Dominican Republic, Mexico, El Salvador, and Peru. In Colombia, I find a mention from the North-East border with Venezuela and the cold, remote highlands of the South. The stories are all very similar: the Mejoral van would turn up in the village, using a loudspeaker to announce the evening entertainment (hence Quechua speakers in Peru dubbed it ‘the talking car’). They would choose a wall, usually the outside of a school or municipal building, on the main square. People of all ages would turn up, sometimes bringing their own rugs or stools, to watch Westerns, slapstick comedies, and Mexican action films. They would bring snacks, typically local products like corn parcels (humitas) in Peru, or ‘cuca’ biscuits and cheese in Colombia. The nostalgic remembrances of these outdoor cinemas talk of the excitement and fun that they brought to these rural audiences. The apparent uniformity of Cine Mejoral throughout its thousands of local instances across a very large region is interesting. So what’s behind it? A market expansion drive coupled with an ideologically motivated project of Continental integration. A perfect storm of capitalist interests, neocolonial politics, and mass media. All this to sell painkillers? Continental unity through shared cultural expressions was one of the strategies of the Office of the Coordinator of Inter-American Affairs (OCIAA), headed by Nelson Rockefeller during WWII. The OCIAA had been lobbying Hollywood to change their usually offensive representations of Latin America, as part of the ‘Good Neighbour’ policy . By the time the US entered the war, the Rockefeller Foundation had already experimented with Pan-American Radio programmes for a few years. Radio was thus the first line of work for the OCIAA, which, as Jose Luis Ortiz Garza explains, had four main propaganda goals, one of which was promoting “hemispheric solidarity”. Content was broadcast on short-wave from the US, recorded on discs for local broadcasting, or scripted to be recorded locally, and it included music, variety shows, thriller serials, and historical programmes. 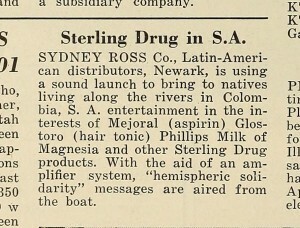 Bayer had already had mobile cinema vans in Latin America, so when Sterling sought to claim the aspirin market for Mejoral, they had to step up. Without proper research it is impossible to say when exactly ‘Cine Mejoral’ was born, and with what equipment, and how its intricate routes were traced, or what role it had after WWII (which is when my parents remember it). This is exacerbated by the fact that ‘Cine Mejoral’ became a generic name for free outdoor screenings, which were later organised by the Church or the municipality. But whoever takes this on as a serious research project will be entering the fascinating realm where geopolitics and childhood experience come together around a sheet on a wooden frame, and the Lone Ranger gallops into a village square deep into the Colombian mountains.